Why I love the Upper Merion Farmer’s Market! – Move Over Martha, I'm Here! So if you’re like me, then you love a good farmer’s market. And I’m lucky enough to have one around the corner from my super suburban neighborhood. It’s the Upper Merion Farmer’s Market, located in the lower level parking lot of the Upper Merion Township Building (UMTB) parking lot in the back of the building, which is minutes from the King of Prussia Mall. They have a newsletter every week which tells you about the vendors that will be in attendance, any specials or events, and who will be playing live music! Also, the UMTB is situated next to a park with a duck pond stocked with fish, a cute picnic area and gazebo, as well as an awesome playground! Back to my love of this farmer’s market. I always leave there with some awesome finds, great veggies, herb plants, and amazing meats from Livengood Family Farm. 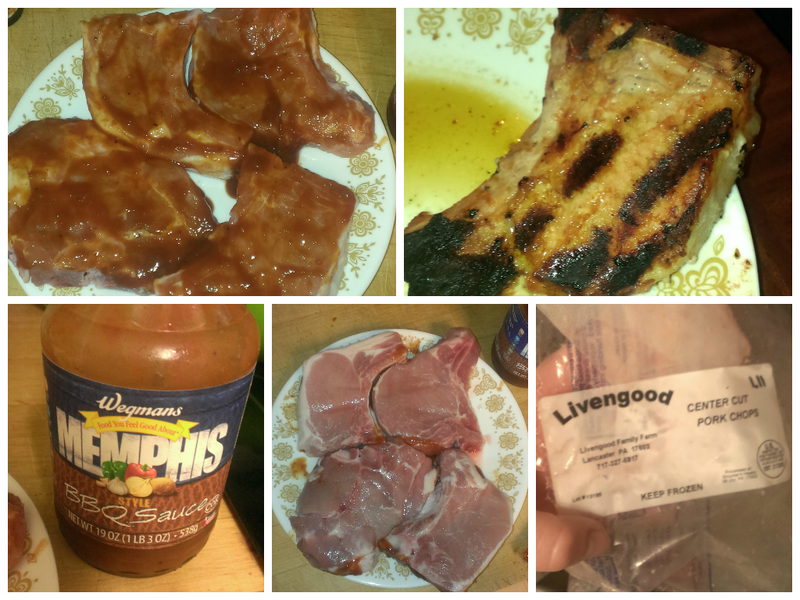 We’ve tried their beef, chicken wings, ribs, and just this week, I grilled up (well… my boyfriend does the grilling, I prep everything and supervise) their pork chops! It’s a touch pricier than in the stores, but I’ve been buying organic meats recently, and there’s barely a difference. Plus, for the sheer freshness, incredible taste, and knowing you’re supporting a good family, it’s worth it to me. So people, here’s my incredible porkchops. I marinated them in BBQ sauce from (you guessed it) Wegman’s and grilled them up with some zucchini, also from the UM farmer’s market. For those times where I sleep in (so all the good stuff is gone at the farmer’s market) I pop on over to my local Wegman’s which has produce from local farms and I buy those products whenever I can, less gas to travel to my house, ya know!? Also, Wegman’s has a blog called Fresh Stories: An inside look at all things Wegman’s and always talk about farm fresh produce, how they’re research new ways to farm more sustainably and sometimes feature farmers. Give it a read! Happy grilling y’all! And shop local!